Telus prepaid brand Public Mobile is back with another switcher offer for customers, in an effort to move them over to postpaid accounts at Koodo. This promo targets customers on the coveted $120/12GB plan over 90 days. Public Mobile here. Con: A deal this good won’t last too long. Pro: 6GB for $40. That’s right, an extra 2GB! We’re all about giving you choice, so if you’re craving more data for the same price, join Koodo by March 15. Get 6GB of data, unlimited text and unlimited Canada-wide minutes for $40/month plus you may qualify for a $0 phone with the Koodo Tab. And get a one-time $100 bill credit! Offer valid for . Redeem at your nearest Koodo location or online at https://koo.do/gocustomer-service. Show this msg and use promo code GOKOODO406GB to redeem along with 2 pieces of ID. 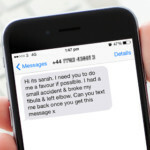 Your phone number is your validation code. You’re included on the list for Public Mobile offers and deals. To be excluded, reply unsubscribe. Conditions apply. Right now, Koodo also has an offer where referrals can get a $100 bill credit, up from $50. The company also recently increased some voice plans by $5 per month and also eliminated Canada-wide calling minutes as well. 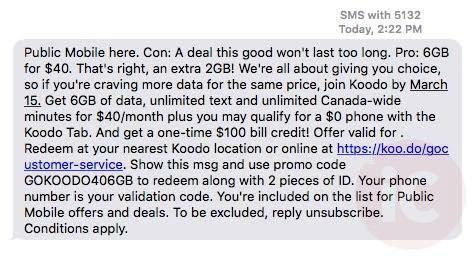 Recently, Public Mobile wanted to get customers on $120/12GB plans to move to Koodo by offering a $40/5GB plan, and its $120/6GB customers to switch to a $45/4GB plan. Did you get this Public Mobile offer today? Are you going to make the switch?